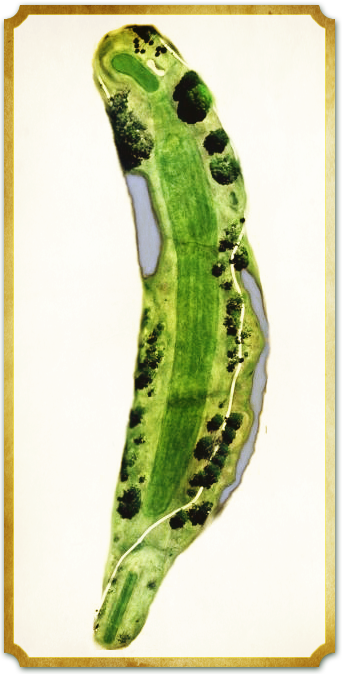 The opening hole is a short par 5 that can offer birdie for a smart player who can avoid the pines lining the fairway and the group of specimen oaks guarding a two-tiered green filled with subtle breaks. Favor the right side on your tee and second shots, and you will be rewarded with a short iron or pitch to set up a putt for your opening birdie. Longer hitters can brave the left side off the tee to take some distance off this dogleg left, giving them the opportunity to get home in two for a look at the elusive eagle.